Below, you’ll find a blog I wrote a few months ago about tape hair extensions. I was excited that I might’ve finally found a new hair extensions method that I liked that was lots quicker to apply. And although I knew they wouldn’t be as natural looking as our tailor made, micro bonds or micro tip rings, I thought the speediness and lower cost might make up for this. I was wrong, and I’m just as disappointed as anyone else might be. I’ve left the original blog as it was (it seemed like a waste of time to rewrite all of it) and added the updates in bold italics. 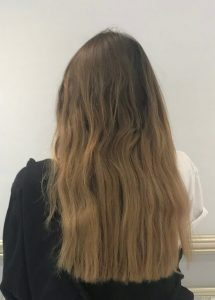 A lot of my clients have been asking about tape hair extensions recently, and I’ve got to say, there are some real positives which make me like them. I love how quickly they can be applied, around an hour and a half for a full head! Considering they stay in for 4-6 weeks, that’s a fantastic return on the amount of time you need to invest. But overall, do tape hair extensions really take less time? Our micro bonds and micro tip rings stay in at least twice as long as tape hair extensions, and when you add all the time spent planning your appointments, travelling to and from the salon, etc. do they really save you any time? Probably not, and even if they do save an hour or so, is the time you might save worth putting up with second rate hair extensions….? All those extra appointments will cost money too. When you consider the quality of the hair used to make tape hair extensions isn’t great and how much better our hair extensions look, are you saving anything at all? No, in comparison, you’re getting less than what you’re paying for. They’re super flat too, and while they’re not as discreet as micro bonds or our micro tip rings, they’re the next best thing out there. Notice, I said “the next best thing”. I thought the cost and time savings might make up for tape hair extensions not looking as good as our tailor-made bonds or micro tip rings, they don’t. 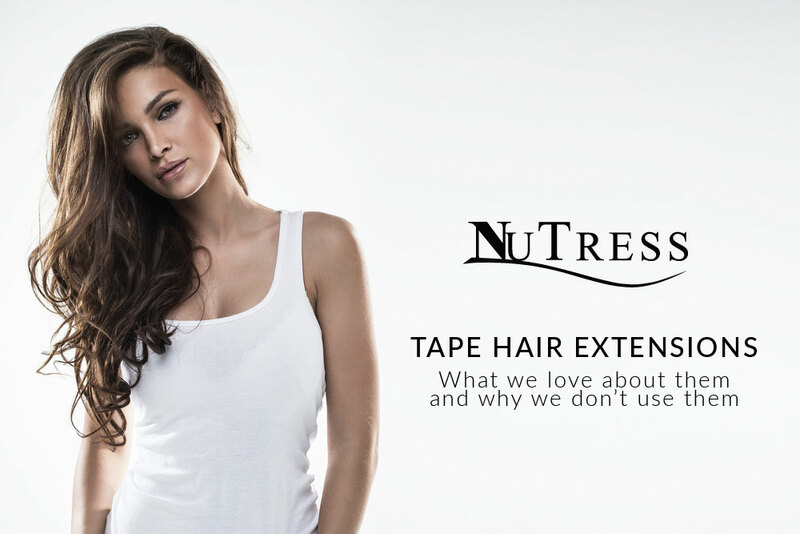 Tape hair extensions can’t be applied close to the hairline, crown or parting – they’re too visible. This limits how well your natural hair will blend and how you’ll be able to wear your hair. Another compromise. And yes, tape hair extensions are flat but in fine or shorter than shoulder length hair, you can see the individual panels! This client paid over £500 in a celebrity endorsed London salon for these “Virgin Russian” (they’re not Virgin) tape hair extensions. You can clearly see individual panels and notice how blunt the ends are. See the short layer of her own hair and how unnatural the hair below looks? This is because you can’t add layers with pre-made hair extensions. This set of tape hair extensions looks nothing like the photographs they have on their website, etc. And before anyone asks, no, I can’t tell you which salon it is! I also love how evenly the weight of the tapes is distributed throughout the hair. This means that so long as they are applied and cared for correctly, they won’t be too heavy and pull on your natural hair- which can cause damage. I stand by this but it’s not that tape hair extensions are safer, it’s because just like tips and bonds, the weight of the hair extensions is more evenly distributed than it is with weaves, wefts, clips. And, just like any other type of hair extension, they need to be applied correctly and properly cared for. ALL hair extensions can damage your natural hair if they aren’t. All those positives to one side though, there are too many drawbacks which stop me from introducing them at the salon. The colour can’t be blended for a perfect match. So, unless your own hair is identical to a shade on the supplier’s colour ring, the best you can hope for is a near match. Or, your extensionist might add tapes in different shades, picking out some of the colours in your own hair but again, this won’t get you an identical match and doesn’t look natural close up. The length can’t be shortened without cutting the natural tip (the ends) off the extensions. Because of this, tape hair extensions only blend well if your own hair is naturally long. They’re not suitable for naturally shorter hair, or hair with shorter layers. What’s more, as with all extensions, if the ends aren’t cut well, they will look horribly blunt and artificial. Unlike bonds and rings, the density of every tape is the same and can’t be changed to suit the differing needs of each client and the area of placement – if placed high, they’re visible, even in thicker density hair. They can also look too dense and unnatural when placed around the hair line. Only tailor-made micro bonds are discreet enough for placement in tricky area’s where there’s less density. I’ve only seen Russian tape hair extensions made from single drawn, not double drawn hair. I’ve seen lots of double drawn tape hair extensions made from Indian and Chinese hair but for quality reasons, we only use double drawn, Russian hair in the salon (please see the Double Drawn Hair blog, which explains why we only use double drawn hair). They’re visible if the hair is worn up, no explanation needed! As I said though, there are some real pluses to tape hair extensions, and they are something that I will continue to look at. If I can find a way of making them on site, I’m not ruling out that I might introduce tailor made tape hair extensions to the salon, but for the time being I don’t think the pros of tape hair extensions outweigh the cons. We’re constantly on the look out for new types of hair extensions. But, it’s more important to us that we don’t lower our standards. Tape hair extensions, as they are, just aren’t good enough, that’s not to say we won’t find a way of making them work in the future. We love to hear from you! If there’s anything you think we’ve missed out, or if you have any questions, please call us on 01612582015.